Despite growing larger this year, NASA says the Antarctic ozone hole is healing | Watts Up With That? This year, the South Pole region of Antarctica was slightly colder than the previous few years, so the ozone hole grew larger. However, scientists from NASA have developed models to predict what the ozone layer would have looked like without the Montreal Protocol, which banned the release of CFCs. “Even with this year’s optimum conditions, ozone loss was less severe in the upper altitude layers, which is what we would expect given the declining chlorine concentrations we’re seeing in the stratosphere,” Johnson said. A Dobson unit is the standard measurement for the total amount of ozone in the atmosphere above a point on Earth’s surface, and it represents the number of ozone molecules required to create a layer of pure ozone 0.01 millimeters thick at a temperature of 32 degrees Fahrenheit (0 degrees Celsius) at an atmospheric pressure equivalent to Earth’s surface. A value of 104 Dobson units would be a layer that is 1.04 millimeters thick at the surface, less than the thickness of a dime. November 5, 2018 in Antarctic, Ozone. Well, thank goodness for all of my efforts keeping the unicorns eradicated from the face of the earth. Just imagine the devastation caused by all the unicorn farts scorching the earth that will not be occurring while I perform all the hard work! I suppose that these fools will take credit for tossing a few virgins into the volcano as well, but they should be careful though because the gods will be angry if they sacrifice the pretty virgins. I have it on good authority that the gods prefer fat cross-eyed virgins. So before talking about the effects of “ozone destroying chemical” they need to control for the effects of high altitude temperature change over Antarctica. I have never even heard that subject raised. Of course with all the attempts to create non-existent surface warming in the Antarctic to shutter up claims of “global” warming , which isn’t global, no one would be allowed to talk about stratospheric cooling. They crowing the fake success of the Montreal protocol as a means of telling we must listen to them about CO2. So before talking about the effects of “ozone destroying chemical” they need to control for the effects of high altitude temperature change over Antarctica. I have never even heard that subject raised. It’s spoken about all the time, for the large-scale destruction of O3 the formation of PSCs is necessary, which requires the stratospheric minimum temperature to drop below -79ºC. An issue is that the baseline for measuring the ozone hole is rather short, so possible natural cycles may account for the changes in the amount of ozone, not CFC’s. What is at issue is that they have no clue as to what is effecting the ozone layer, but are willing to conclude that whatever effort they prefer was the cause for the change. It’s unicorns. Unicorn flatulence has a particular affinity for quenching O3 molecule UV reactivity. So if you see a unicorn… shoot it. With extreme prejudice. The issue arose when DuPont’s patent protection ceased. Penguins with skin cancer. Again. Exactly so. We didn’t know about the ozone hole until the 1970s when satellites started measuring the ozone layer. link We have no way of knowing the natural size of the ozone hole. I find it suspicious that someone said there should be an ozone hole and, lo and behold, a never before noticed ozone hole popped up. It could be a really good prediction or it could be a case of what we used to call Cook’s Constant. We didn’t know about the ozone hole until the 1970s when satellites started measuring the ozone layer. link We have no way of knowing the natural size of the ozone hole. No, ozone was measured since the late 50s and was reasonably stable until the late 70s (~300DU). It then rapidly dropped about 150DU giving rise to the Ozone hole, natural size of the Ozone hole (below 220DU) zero. Forgive my utter ignorance of the subject but “Colder-than-average temperatures in the Antarctic stratosphere……“? I thought the planet was supposed to be warming? And does this include the newly discovered CFC contamination coming from China or not? Generally when the anomaly in the stratosphere is cold the anomaly in the troposphere will be warm and visa-versa. As for the Chinese I doubt their illegal production and use of CFCs is factored in. When it comes to the PRC the SOP is hear, see, nor speak any evil. Unless I am very much mistaken, there seems to be something wrong in the conversion of miles / kilometers. If 1 nm = 1.609344 km then 12.2 million km² else ??? Ouch. Not nm but statute mile…confusion takes its toll. No. You need to multiple by 1.6 squared. No, that was correct, but is the ozone layer a constant and very thin thickness? So for example does the hole size reflect thinning of the layer as well as an actual “hole”? The hole in the ozone layer is identical to the kind of hole you get when you dip a bucket into a lake and pull it out. Dobson unit is meant to be confusing. OZone thickness varies from 9 ppm down to 3 ppm. The equivalent of three dollars out of $1 million. Remember, matter can neither be created nor destroyed, O-Zone only changes back to regular oxygen. To stop the creation of O-Zone you must remove the two major ingredients. 1, remove all oxygen around the planet, or 2, remove all ionizing radiation from the sun. As long as you have these you cannot stop the creation of O-Zone in the upper atmosphere. As long as the sun is active, you cannot stop the magnetic field from pulling in polar stratospheric clouds from space. The size of the ozone thickness is directly proportional to the activity of the sun. The polar stratospheric clouds burn off with the first rays of spring (delayed with cold temperatures) and everything returns to normal October to November until the next year. UV B, C, x-rays are blocked by our atmosphere of oxygen and nitrogen. O-Zone is such a small fraction, that it’s not even relevant to the conversation. There is only one factor to be considered in the amount of O-Zone self regulation in our upper atmosphere, and that is the amount of O-Zone and nitrous oxide available to cause the reaction that turns it back into normal oxygen/nitrogen. Evidence? The sky is blue as oxygen is broken up by sunlight to form O-Zone, the sky glows green at night (as seen from the space station) when energy is given up to return to normal. With 24 hour sunlight in Anarctic summer, the ozone levels can reach 10 parts per million before it consumes itself as fast as it’s being created. The average temperatures go from a winter low of 70° below zero to a summer high of 40° below zero with 100% sunlight/UV for 24 hours a day for three months. What model predicts this? Any? Chlorine is too heavy of an abundant element (sea salt) to reach the stratosphere without the help of a volcano. If it could get up there, it would react with hydrogen to form hydrochloric acid and be abundant in the polar ice, which it is not. Chlorofluorocarbons, 4x heaver than air, are stable to 2000°. It would have to reach the thermal sphere, above the stratosphere, to break apart. If free chlorine was really an issue, they would have banned chlorine for pools, drinking water, washing machines long ago. O-Zone thinning has always been a political issue, for which they are gracefully backing away in hopes that we will forget about it by 2060. The Ozone concentration between 15km and 21km drops to zero during the spring down from a maximum a month or so earlier. Arctic polar vortex often weakens and more often than not splits into two, however I could find only references to one occasion (September 2002) when the Antarctic’s polar vortex split and even then it was not very distinct image. It is understood that the SSW leads to weakness of polar vortex but those events in the Antarctic are infrequent. The polar vortex is indeed important. Look at the picture in the banner. There are higher than average ozone concentrations just outside the vortex. That is typical for the early-Spring. Most ozone is created in the tropics and moves polewards. The vortex prevents it from reaching the interior, thus depriving the Antarctic from replenishing the depleted ozone. NASA never talks about that. The vortex prevents it from reaching the interior, thus depriving the Antarctic from replenishing the depleted ozone. NASA never talks about that. Indeed because it’s not true! When the vortex seals off the polar stratosphere in the winter the O3 is trapped there. It remains there through the winter as there is no light there to initiate the destruction of the O3. In the spring the return of sunlight rapidly destroys the O3. There is actually rather strong evidence that the antarctic ozone hole is due to halogens from Mount Erebus volcano that has been erupting continuously since 1972. In winter there is no real tropopause over inland Antarctica so the volcanic gases can reach the stratosphere. That’s an interesting idea. Do you know of any links that explain this in more detail…in particular in relation to Erebus’ emissions profile? So why was the ozone whole Not detected before th mid-80ies? Nobody was looking for one? Dobson and his Colleges did. No, it was seen (poorly, since the instruments were not in orbit) right from the beginning, when Dobson began looking in the 1950s. Since the 50s, when we looked, we have never FAILED to see an ozone “hole” in the Antarctic late winter/early spring. When satellites began looking down from space, we finally got a true picture of the size of the phenomenon for the first time. That the size was quite large surprised many, and some small-minded idiots at that time decided that a first time observation of a natural phenomena must be a human-caused crisis. NO respectable atmospheric scientist is worried that the ozone “hole” will spread to populated temperate zones. Only alarmist idiots will do that. Take comfort from the fact that that the ozone layer collapse over Antarctica is an annual, natural occurrence, and realize that, while there is MUCH speculation, there is no reliable evidence that anthropogenic CFCs or HFCs have anything to do with it at all. It poses no danger to humans, who, if they are in Antarctica and outdoors when the “hole” is present, must be very securely bundled up against frigid temperatures, and risk little from UV exposure. However, if you are one of those Montreal Protocol fanatics, I invite you to go to Antarctica and do a full, bare-naked skin exposure test to see if you sustain UV damage. You can leave your hat on. There is actually rather strong evidence that the antarctic ozone hole is due to halogens from Mount Erebus volcano that has been erupting continuously since 1972. No, the evidence is that that is not the case, chlorine from Erebus ends up snowing downstream. Just out of curiosity and because frankly I don’t know, has anyone tried to correlate the Antarctic ozone hole with the changes in the Earth’s magnetic sphere adjust for seasonal variations? Because their climate models have done so well. The Ozone Hole keeps growing, despite the best efforts of do-gooders. The do-gooders have to show how immensely important their efforts are – at least in a modeling realm. This has apparently nothing to do with the expiration of Freon patents by DuPont at about the time when the Hole was discovered. Many sciences resemble computer games these days. Not to mention the ones that made a killing on R-134. A model that assumed it would be bigger if they had done nothing so lo and behold the model showed that it would have been bigger. And my bet would be that the bigger hole was utterly and totally dependent on the assumptions made about how big it would get. So the ozone L has grown over the past number of years and this is good news! No, what this is is a doubling down on another failed alarmist proposition. The reason? Its because its a lot colder in Antarctica!! These guys are even happily rationalizing the ozone increase by throwing a bit of global warming under the bus. The new normal science is to go with consensus science (science by committee) and any counterindications are rationalized into support for theories that “are too big to fail”. BTW, I always point out that the ozone hole is always surrounded by a thick “collar” of ozone like the rolled back neck of a turtleneck sweater (orange in the image). It hasn’t disappeared its been redistributed. I always also point out that the ozone hole is in the Antarctic, yet they warn we are getting increased risk from UV exposure in the temperate zones where the ozone from the hole has been redistributed to. I can see where a 100 years from now, while the world hasnt really suffered any negative global warming side effects, the new normal science will be pronouncing some dangerous change one way or the other. When can we let this terrible amoral age go. It does disappear in winter. Ozone is created by sunshine (UV) and there isn’t any in Antarctica in winter, so of course the amount of ozone goes down. What varies a bit between years is the rate of decrease. The effect is much weaker in the Arctic, where there is just as much CFC:s (probably more as a matter of fact), but no active volcano and much more air comes in from lower latitudes. That’s right tty. Why is there a hole problem above Antarctica but there isn’t a problem over the Arctic? Most of the CFC’s were generated in the northern hemisphere. Did the CFCs just fall down to the southern hemisphere by some magical mechanism? It doesn’t make sense! CFCs flow downhill so simply by looking at a map on the wall you can see the CFCs must go to the South Pole. And besides that, Antarctica is a lot closer to Australia, and everyone knows SA tries to get by on renewable energy. That’s pretty much the main thrust of the scare IIRC from the 80’s, CFC’s released in the NH appeared over the southern pole to create the whole. Never mind the fact ozone is also repelled by magnetic fields. If it’s turbulent mixing, why isn’t there an equal size hole over the Arctic? It doesn’t make sense. Yes it does, the creation of the hole depends on reaction kinetics and photolysis, the mixing of CFCs around the globe and into the stratosphere is controlled by turbulent mixing. The kinetics is controlled by the temperature in the stratosphere, catalysis due to the presence of PSCs is a major factor and that requires temperatures less than -79ºC. That is why the large hole is formed over the Antarctic and why a small hole forms less frequently over the Arctic. Not sure if you’ve explained yourself very well. Think about it. Any thoughts on my other points, that the ozone is rolled back from the polar area and doubles up as a collar around the hole (orange annular area in the image). Indeed, this thickening of the ozone in the bordering may mean O3 is just redistributed. If so why we in yhe temperate zone should br worrying more about UV? Because fear sells! Products, insurance, warranties, inspections,etc. Speaking of this sort of fear Gary, we Yanks will be trudging out tomorrow to try and vote down the candidates and incumbents we fear the most. A big change in approach from my young adulthood. There is a lot to like about your conclusion. It has been obvious for a long time. It’s been obviously wrong for a long time. Because that isn’t what happens, the vortex isolates the O3 over the pole during the winter and because of the lack of sunlight stays approximately constant. Once the sunlight reaches the polar stratosphere in the spring the O3 rapidly decays to form the hole. It does disappear in winter. Ozone is created by sunshine (UV) and there isn’t any in Antarctica in winter, so of course the amount of ozone goes down. No it doesn’t, it stays approximately constant the ozone is destroyed by sunlight in the spring! Which has nothing to do with it, what counts is the relative absence of PSCs in the Arctic which is the catalytic agent involved in the O3 destruction. To the rational mind, maximum ozone hole size stabilizing (more or less) 8 years before global chlorines started to decrease suggests that the effect of CFCs on the ozone hole is overblown. CFCs may be being produced in China but that isn’t affecting the Antarctic. Warm air rises (at the equator) and carries the emissions round to the nearest cold part (the pole) where it sinks and the cycle continues. China, North America and Europe are in the northern hemisphere so their emissions aren’t causing this “hole”. Their emissions go to the North Pole. The global villains are the Australian Cricket Team with their spray-on sunscreen. I knew they were the cause! Finally the truth is coming out. Why don’t you hear about this in the MSM? And a more villainous group of men have there ever been? I still feel embarrassed at how easily I was fooled by the ozone holers. 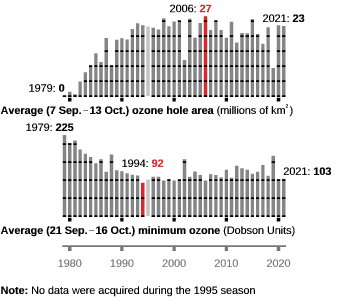 I had long been skeptically open-minded about how much they could really measure, understand, or predict about ozone before the sudden “discovery” of the gaping Antarctic hole before the process that then led up to the Montreal protocol. The success of this was, I think, what gave them the confidence for the much bigger play of attacking carbon dioxide itself-Facts and careful deliberative science didn’t matter if you knew that you could get a media band-waggon in front of you. Curiously, another very similar thing happened to me in ~1997. After the Oasis mania in popular music, I moved to live in the USA. Separated and isolated by distance and less communication, I mistakenly bought a ‘musical’ album on the basis of all the distant media hype and also because a close friend failed to ridicule the group when I asked over the phone about the latest thing and should I listen to them. My, how she laughed when I later told her that I had bought a Spice Girls tape. Same here John. Possibly a Google browser issue? Funnily enough, a company not exactly known for their love of sceptical sites. Tossing a few targeted ads in to disrupt your non alarmist viewing pleasure would surely be beyond their capabilities wouldn’t it? Probably not. Wow, this is a bit weird. I just posted a note about Google substituting an advertisement for this page on WUWT (and kicking Anthony’s page completely into touch). But my comment vanished too. Have you seen it more? My comments are taking a little time to appear too and I am also UK-based. a similar thing is happening with my I pad. I get diverted to a site which offers me a free I phone whic I can close but I get diverted to. Google site advertising various thins such as Primark. With three questions about in. a quiz about IT individuals such as bill Gates. No way to close this have to exit to a different website and then back to Wattsup. This happens 3 or 4 times when I enter the Wattsup. Then goes away. I to am in the UK. This is yet another statement that says that whatever is the cause of the problem is exactly what they say it is, and any evidence to the contrary is non-fact. They have, in fact. no clue about what is really affecting the Ozone Layer. However, they do conclude that the implementation of their solution to the problem was the cause of the triumphant outcome. Perhaps NASA should concentrate on SPACE, and should leave the studies of Earth to those best qualified to do that. Anyway China may well still be using the original and far better CFC’s , not believing in the Greens fairy tales. Utter BS. It is rediculous to talk of nature “healing” when one doesn’t know what the healthy, normal state is. Frankly, I reckon the polar holes have always been there, certainly since they were first discovered. I don’t think there were any holes, it was just a thinning. But as you say no-one knew what the “healthy normal” state was. It was just the scare du jour at the time. it makes them feel good and helps them extort more tax payer money. The hole in their story though is the total ozone layer hasn’t changed much. but global warming is destroying the lower ozone layer. The hole in the ozone layer is extremely difficult to prove or disprove. It was probably a hoax to see if we would buy the bigger hoax-catastrophic anthropogenic global warming/ the even more obvious “climate change” hoax, whatever “climate change” actually means. Is it getting warmer, cooler? What time frame? is it man-made? Natural? Bit of both? Is it dangerous? Can we do anything about it? Could it destroy our civilization by chasing rainbows to try to conquer nature? Is it a big extortion racket by those that stand to make trillions? Am I allowed to say it? It’s just models, all the way down. Notice that there is no mention of Global Ozone levels. If the hole is reducing as they claim then the Overall Ozone levels must be increasing? We all know that the Solar EUV, and UV create Ozone. Due to the quiet Sun, less EUV and UV are being produced. This creates less Ozone in the upper atmosphere. Also, the new data showing the amount of cooling in the upper atmosphere due to reduced Solar output. 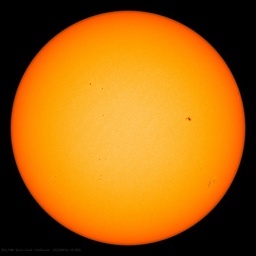 The cooling is nearing an all time low… [see Space Weather]. Now, where is the graph and/or data, relating Solar EUV, UV to the amount of Ozone produced??? How can we make a scientific analysis without that data??? And we also know that UV destroys Ozone. For something to heal, it has to be sick. The ozone depletion in the stratosphere over Antarctica is natural, so it cannot be healed. The Montreal Protocol was extremely effective at making air conditioning more expensive, but has had little impact on stratospheric ozone, which ebbs and flows largely due to natural factors that have never been studied. The same is true for climate change in general. It is far easier to appeal to the guilt of the Western World than to do science. How on earth do heavy chlorine bearing molecules get high into the ozone generating altitudes? This is another model hoax but from Montreal, not UN IPCC. Ozone has fluctuated with temperature because of the kinetics of the reaction. The atmosphere is in climate change hiatus. Diffusion and turbulent transport, that’s why the lower atmosphere is called the homosphere because the composition of the atmosphere doesn’t depend on Mol. wt below ~60 km. Then why doesn’t the Ozone produced at ground level make it up to the stratosphere as a well-mixed gas ?. This is where your own ideas are in contradiction. If the only way to get Ozone in the stratosphere is from solar radiation striking an axygen atom, rather than from turbulent transport and diffusion, then it must also be impossible for a chlorine molecule to make the same journey. The difference between Ozone and CFCs is their chemical reactivity. CFCs are chemically inert, their lifetime is over one hundred years, consequently when emitted near the surface they have time to be distributed throughout the atmosphere (takes about 5 years). Ozone, on the other hand, is extremely reactive. Ozone is formed near the surface predominantly by photochemical reactions of the emissions from combustion processes, it usually peaks during summer afternoons. It is continually reacting with other species in the atmosphere so in the absence of sunlight it disappears. Consequently it doesn’t have time to spread through the atmosphere as a well-mixed gas. Up in the stratosphere ozone is predominantly created by the UV-photolysis of O2 (which can’t occur near the surface because the UV doesn’t reach that level). Due to the lack of other reactive species in the stratosphere O3 is sufficiently stable to form an ozone layer. If it is transported lower it will encounter reactive species with which it can react. CFCs which reach the stratosphere will encounter UV light and photolysis will produce Cl atoms there which will cause depletion of O3. This is worst in regions where Polar Stratospheric Clouds occur because of their catalytic effect on the destructive processes. I still say that the ozone hole is just mother nature belching out all that excess CO2. I would love someone to go back and publish all those promises EPA made based on the USA getting rid of CFCs. Shouldn’t the hole be long closed? If only the CFC causing ozone depletion was just limited to refrigerants. About 20 years ago the pharmaceutical albuterol inhalers for asthma (Ventolin, Proventil) lost their patents and generic versions came to market. These inhalers contained very small amounts of CFCs as propellants. Cynically, pharmaceutical manufacturers conspired and cooperated with environmental groups to get CFCs removed from inhalers by EPA edict. This removed inexpensive generic albuterol inhalers from the supply chain. In place of the generic inhaler the FDA approved three “brand only” albuterol inhalers – Proair, Proventil and Ventolin) that are “CFC free”. These have been patent protected for the past 20 years and cost 4 times the price of the old generic inhalers. The patents are all expiring, but the FDA keeps denying generic applications. Each of these products has different, specialized formulations and delivery systems. American asthmatics have paid billions in unnecessary prescription costs due to bogus “save the ozone” regulations from the EPA. The ozone hole story is a total fairy tale. And now the everything and nothing scare. Man y years ago I said “Were their any two headed Penguins in Antarctica. It was also of interest that while the “Hole”was only in Antarctica”, not a problem, but then it was “Discovered in the North, Panic. Now its just another Green monster. Snag is we are not only fighting nutty Greens, but big business as well. Wasn’t the Ozone layer first discovered around 1918 and the first Ozone depleted area found in 1926? I am truly baffled. In the almost six years during which I’ve been studying the matter, I’ve seen actual conditions in Earth’s atmosphere corroborate in great detail the conclusions I’ve reached, as detailed in: https://wattsupwiththat.com/2016/10/10/interesting-climate-sensitivity-analysis-do-variations-in-co2-actually-cause-global-significant-warming/ This research recently gained peer-reviewed status in the September issue of the Asian Academic Research Journal. Despite the fact that my research has successfully predicted the behavior of Earth’s atmosphere resulting from the introduction of anthropogenic CFCs during the period 1975 to 1998, identifying this as the actual cause of global warming, and not CO2 at all, this research has received virtually no recognition by either the “warmist” or the “denier” camps. I can only assume that this is because both sides have it wrong, and they are both desperately intent on defending their flawed positions against all comers. Nonetheless, the ONLY model that correctly explains the behavior of Earth’s atmosphere since 1975 is mine, yet it isn’t even considered as anything other than idle speculation. I suppose this means that after 20 years or so of this prevarication, long after I’m dead and gone, climate scientists will finally converge on the unthinkable, that “by golly, David Laing got it right, after all! How about that?” Well, then, how about that?